“There are some people in life that radiate a special quality of love that is unquestionably present where ever they go; with each step they take, there is left behind a footprint in the heart of those they meet. Sue is one of those rare people. But there is nothing cordial or light about the warmth she shares, even though laughter is always close. The kind of footprint she leaves is deeper than that, it has a quality of encouragement, of calling out the highest in others, of infusing the heart with immense possibilities and the strength to fulfill them. Her style of teaching is her style of living, it is full-bodied, bountiful, astute, tender and intelligent. She is able to hand shape her approach towards each person, so as to extend them and at the same time hold them to themselves and encourage them to trust in the opening, creative adventure they are on. She emphasises that every life experience has gold in it and if you know where to look, you can find it, mine it and grace others with it’s riches through story. Sue is a beacon of a woman, who showed me the way, the rocks in the way and how to stand on the shoreline of my own life. Working with Sue helped me to see that stories are like rivers running towards an infinite heaving sea of stories upon a deep ocean of togetherness. My experiences are not all that personal after all, but actually universal to us all and through storytelling I can share the spirit of compassion, forgiveness and understanding with others. “I first met Sue at the International School of Storytelling festival in 2013. Sue was running a workshop that I was not booked on to but that I had an urge to attend. Although the workshop was full, Sue greeted me with a broad smile saying ‘Well, if you’re here it’s because you’re meant to be here. Welcome!’ That sums Sue up. She doesn’t sweat the small stuff and greets the unexpected with professional and personal ease. That workshop inspired me to sign up to do the 5 week biographical storytelling course, Your Journey, Your Voice. I learnt more with Sue in 5 weeks than I have in years and years of poking about at my own stories and not for one moment during those weeks, did Sue’s beaming smile fall from her face. She poured every ounce of attention into each person’s story, encouraging each and every one of us each and every step of the way. Sue has a solidity that made me feel utterly safe to say and do whatever felt right at the time but do not be fooled by her ever present smile! Although Sue encouraged me more than I have ever been encouraged in my entire life, she also didn’t let anything get past her. I am usually the master at being able to mumble my way out of a tight spot but Sue’s dedication to her students meant that she can spot the truth in even the most professional bluffer! And that is what Sue does, she ‘sees’ you and greets what she sees. How often do we pass through life unseen, or with the fear of being seen and Sue’s uncanny ability to see what others do not was, for me, a life changing experience. With one arm she holds you and with the other she fishes inside and finds your truth. “It was in a course in Cape Town. I still remember I was a bit tense about going to a course far, far away, where I was not familiar with the culture at all, and where minor crimes happen daily. But as I entered Erin Hall and started to saying hello to the people, someone short came towards me with a beaming smile and there was Sue (as you can see in her photos!). Immediately I felt the tension in me drop away and I felt comfort and trust. As the course went on, I started to discover her unique but special talents. 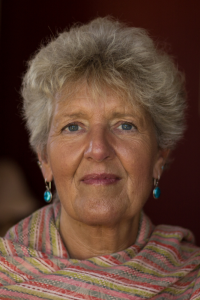 Sue is a great teacher who balances in a very beautiful way the two polarities she has inside herself: great leadership to lead the participants in gentle ways, yet with sharp observations as a teacher. Her attitude to everyone is open, very human. She is very practical and structured but full of joy and flexibility! I still remember her dancing to loud music in the morning before class, singing songs she is crazy about, and her practical care in every small detail. I have learnt from her not only how to be a good storyteller, but also how to be a whole human, with strengths, weaknesses, and accepting everyone. “I did my training in Cape Town and I still cannot forget the experience I got from the course. Sue was the embodiment of what a good teacher should be. Her passion and love for storytelling, her teaching methods and her storytelling technique has had an everlasting effect on me as a learner. What has been most useful to me in my literacy teaching approach is the multimodal approach to storytelling that she used. Not only did we use our voices and language but we used our bodies, movement, art, and music in an orchestrated way to produce beautiful stories. Indeed my approach to literacy pedagogy in my current doctoral studies is built around this. 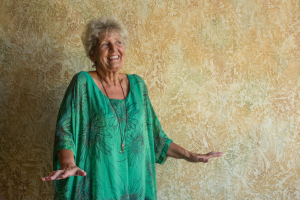 “It was with some trepidation that I signed up for a three month storytelling course. I had fairly recently retired and had normally never had problems with business presentations but then at least I knew more or less what I was talking about! This seemed different, this was telling stories. I learned a lot during those three months: not only the craft of storytelling but also just to observe and learn how Sue handled our motley crew of individuals with all their idiosyncrasies. It was an admirable mixture of robustness and sensitivity. This sounds perhaps a bit contradictory but that is where Sue’s people skills came to the fore, she knew exactly when to stand firm and take no nonsense and when to be sensitive to people’s vulnerabilities. I found the latter particular supportive when I had to tell my biographical story which was probably the scariest part of the course for me.